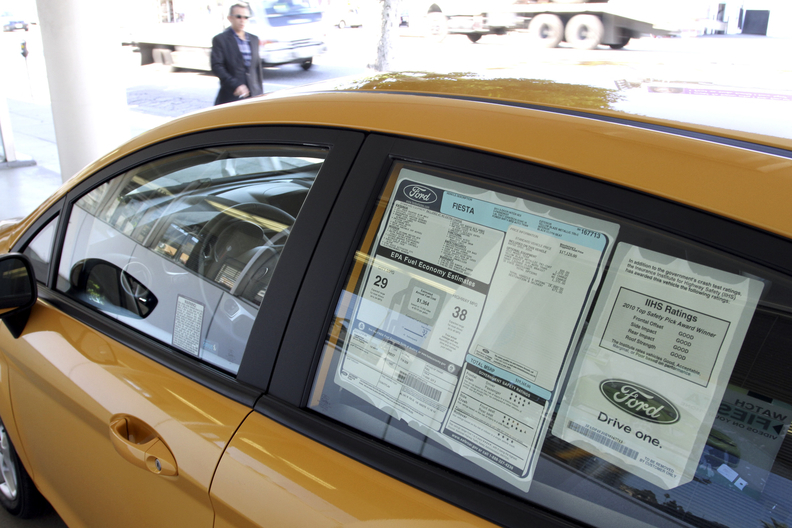 A 2011 Ford Fiesta subcompact sits on display at Buerge Ford in Los Angeles, Calif., in January. Since late fall, the small car segment has recovered two percentage points to account for 21 percent of industry sales, reflecting the rise in gas prices. Many U.S. auto dealers expect gasoline prices to keep rising in the wake of political turmoil in the Mideast. They say they will adjust their product mix accordingly -- aiming to stock more small cars and fuel-efficient crossovers. The average national gasoline price is about $3.19 per gallon, according to the U.S. Department of Energy. That's about 54 cents higher than a year ago. With political unrest spreading in the Middle East from Egypt to oil-rich Libya, some pundits expect gasoline prices to soar. In commodities trading today, the price of West Texas Intermediate crude oil rose 13 percent to $97.97 a barrel. Many auto dealers are planning for gasoline prices to keep rising. "We'll change the mix of products that we offer," John Pitre, general manager of Motor City Auto Center in Bakersfield, Calif., said today. He sells GMC, Buick and Lexus vehicles. "Hybrid demand has been pretty weak the last couple of years, so you can count on that coming back to life." Pitre's inventory lacks GMC's more fuel-efficient products such as the Terrain and Acadia crossovers and diesel pickups. He plans to order more. The U.S. small car segment comprised about 14 percent of U.S. auto sales in 2004, said George Pipas, Ford Motor Co.'s chief sales analyst. By 2009, it had risen to 21 percent. It slipped to 19 percent last year. But since late fall and into January, the small car segment has regained two points to 21 percent of industry sales. That's due mostly to gasoline prices creeping up, Pipas said. "So far in February [the segment] is up again," he said. "Suffice it to say that it was up more than a point over February of last year really early in the month." Slowly rising gasoline prices have affected used-vehicle prices, said Jonathan Banks, senior director of editorial and data services at NADA Used Car Guide. He said changes in consumer behavior typically show up in the used-car market before the new-car market because used-car buyers are more sensitive to changes in gasoline prices. Banks' data indicate that used-truck prices generally are falling while used-car prices inch higher. "Trucks have not been in a free fall, like we saw in 2008, and we don't expect them to because supply is so tight. But you can see that the trend between cars and trucks is significantly different," he said. Dealer Pete Adcock, president of FSK Lincoln-Mercury Inc. in Frederick, Md., said he can't find a 1- to 2-year-old Lincoln Navigator and Cadillac Escalade for a reasonable price because automakers reeled in production in 2008 when gasoline prices spiked then. He worries they'll have a knee-jerk reaction this time and he'll struggle to get newer used pickups and SUVs to sell. David Brady, an owner of two Hyundai dealerships and one Kia store in suburban Huntsville, Ala., started paying attention to rising gasoline prices in November. He said gasoline in his area is now about $3.09 a gallon, up from roughly $2.25 a gallon about a year ago. In January, Brady ran 60-second radio spots urging customers to come in and trade their large SUVs for smaller, more fuel-efficient vehicles. On Tuesday, he sold two new Kia Souls and a new Rio to customers who traded in 2004 and 2006 Chevrolet Tahoe SUVs and a 2001 F-150 pickup. He said 90 percent of the vehicles he is selling are fuel-efficient nameplates such as Kia Rios, Fortes and Souls. He said February has been a great sales month and he attributes it to the price of gasoline. "The biggest problem I'm going to have is keeping the right inventory mix," he said. Mitchell Dale, owner of McRee Ford in Dickinson, Texas, said prices for large SUVs and pickups have softened in the past two weeks. In general, he said, there is increased discussion about gasoline prices, but customers still have a wait-and-see attitude. "We've seen some people do trade-ins, but not the panic sell of 2008," Dale said. Mike Sullivan, who owns eight dealerships in the Los Angeles area, said he hasn't seen a mass exodus from SUVs and pickups yet. "There's no question in my mind that we are going to see it," he said. Sullivan owns Toyota, Lexus, Scion, Audi, Volkswagen and Porsche dealerships and is opening a Fisker store. He said elevated gasoline prices will exacerbate the trend of moving to smaller, more fuel-efficient cars. "The threshold has moved. Four dollars used to be the panic mode and that's not going to motivate people in and of itself," Sullivan said. "I don't think $3.90 or $4.05 is going to make people panic." Mike Connolly, sales manager at Planet Chrysler Jeep Dodge in suburban Boston, said customers want to keep their bigger vehicles, but shop newer versions of those models that often earn higher fuel economy. Connolly said dramatic consumer behavior will begin when it starts to cost more than $100 to fill the tank. "What happened back in the summer of 2008 when prices were through the roof, it's nothing like that now," he said. "People want to get better gas mileage, but it's not a panic."